When Chaviano was 13 years old, he left his family in Cuba to set out on his long journey to the United States. It was a risky, emotionally trying decision, but one that was necessary for his future. In Cuba, if you didn’t leave by the age of 15, you had to enlist in the military, which would have left Chaviano confined to the country until at least the age of 27. Further complicating his plan was the very real threat that his parents could be accused of being counter-revolutionaries for sending him out of the country. Consequently, he left Cuba under the pretense that he was going to Spain to attend seminary school and become a priest. Once his parents and two sisters were back in the picture, it was all hands on deck. Chaviano may have come from a family of professionals—complete with a dental practice owning, University of Havana Dental School professor as a father—but, in the United States, it was a very different scenario. Money was scarce and everyone had to contribute to keep the family afloat. Before his parents arrived, Chaviano already had two newspaper routes and by the age of 15, he was working at a dry cleaners sweeping floors and doing maintenance around the shop. When his family arrived from Cuba, they moved to Elizabeth, New Jersey, and he began working at a fast-food joint as a fry cook. To compound the pressure, Chaviano was also the man of the house. His father had to revalidate his credentials in order to practice dentistry in the United States, which required moving away for two years to attend dental school. The overwhelming responsibilities and the experience as an immigrant in America left Chaviano feeling completely displaced. As the attorney says, he came from a “well-to-do” family in Cuba; a family of professionals with means, so his new life in America gave him a brand new vantage point, raising his consciousness and opening his eyes to social issues. Though there was pressure to obtain a medical degree—and after a hellish year of premed that left Chaviano morbidly unhappy—he decided to follow his newfound passion for law after taking a legal history class with an impassioned professor. The rest, as they say, is history. 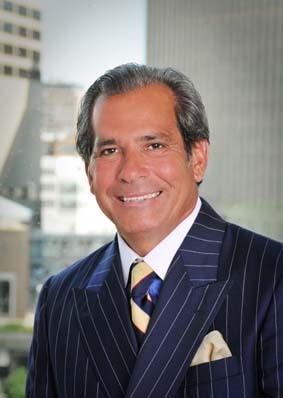 After graduating with a BA from Rutgers University and a law degree from Northwestern, Chaviano went on to serve as corporate counsel for an esteemed malpractice-insurance-underwriting company and as an attorney at a private firm, which eventually led to the role as cohead of its new house counsel operation. Chaviano has also run his own firm, taught law at Northwestern as an adjunct professor, and served as president of the Hispanic National Bar Association and as secretary general of the Inter American Bar Association.